...on a family visit.Terribly crowded train on the way back, because some of the railway staff were on strike, so some trains were cancelled....but although the passengers were packed rather tightly, everyone was in good humour, and the journey as actually rather fun...a tired child was given safe refuge on a stranger's lap, some one shared out bottles of water and packets of shortbread, we all chatted and swapped jokes...the staff were all helpful, there was a good atmosphere. I think it was partly because the train was not too hot, and there was somehow a gently Autumnal end-of-holidays mood. At Reading people even squeezed up a bit to let on even more passengers. At Paddington people helped one another with luggage. Sometimes it really does feel as though we do share a common home in Britain and can cope together. 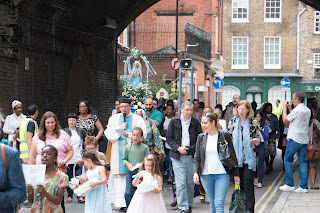 after Sunday Mass at Precious Blood Church, London Bridge, saw us busy discussing various arrangements for the Ordinariate Festival (see links below). One of the (many) things that I enjoy about the Ordinariate is that the refreshments include real coffee...and before you sneer, just think about it: why have so many Catholic parishes, groups, associations, and schools, come to assume that it should be standard to offer orange/brown powder topped up with hot water to form a nasty brown liquid? Why not big pots of tea and coffee, jugs of milk, and volunteers serving and pouring and handing-round and washing-up? An informal working group tackling refreshments for this year's Ordinariate Festival has organised the transfer across London of the neccessary jugs and equipment to serve decent coffee to 200-300 people at Westminster Cathedral Hall. It can be done. We did it last year and people arrived from across Britain to be greeted by fresh coffee and tea and doughnuts..
...of the Ordinariate of Our Lady of Walsingham will take place shortly . ...of the most delightful sort. It began on the steps of Westminster Cathedral where I met the group of Americans who had asked me to take them on a Catholic History Walk. They were delightful, and we set off for a couple of hours to walk through centuries and centuries. We started w. the Cathedral itself with its joyful recent memories of visits by St John Paul the Great and beloved Papa Benedict, and then off down Ambrosden Avenue and some history of Archbishops from Wiseman and Manning through to Heenan and Hume and so on...and thence along past the Horseferry Road and some history of London's bridges and the revenue from the ferry which went to the Archbishops of Cantrerbury for hundreds aof years. And so down to Parliament, with a glimpse at the coat-of-arms of the Westminster City Council which shows Our Lady cradling the Christ-child, and down past Abbey Orchard Street and along Great Peter Street...and we finished along by Richard Coeur de Lion and then Big Ben. We brewed tea and coffee and made lunch in the well-equipped kitchen, talked and laughed and worked hard...it has been a happy week. Festival at Westminster Cathedral Hall on sat Nov 28th. Picking blackberries and making a blackberry-and-apple crumble makes the grace before meals have a real meaning, giving thanks to God for this food "which we receive from Thy bounty..."
A meeting at St George's Cathedral to make arrangements. This building is one of London's hidden gems. It is Pugin's gothic, 1840s, much older than Westminster Cathedral. Fascinating history - the high altar stands on the spot where the Gordon Riots began. Some fine chantry chapels, a great sweep of gothic glory as you walk up the main aisle. Pugin himself, brilliant but troubled, ended up in the Bethlehem Royal Hospital - Bedlam - which stands opposite and is now the Imperial War Museum. I'll be leading a tour of St George's Cathedral on TUESDAY OCTOBER 6th. Starts after the 12.30pm lunchtime Mass. ALL WELCOME - just come to the Mass and we gather afterwards. ...a reassuring reply from my Member of Parliament, to whom I wrote about the planned change in the law to permit people to assist in the killing of gravely ill friends and relatives. He plans to vote against the law. Have you written to your MP to be asurred that he or she will do the same? When some one dies there are all sorts of consequences - including, sometimes, considerable financial advantages for relatives, and the removal of all sorts of inconveniences that have resulted from the person's illness. The reasons for our laws against encouraging people to kill themselves are not only moral (reflecting our Judeo-Christian heritage) but also practical - society needs to protect itself against the nasty side of human nature. Most of us at some stage will have to care for some one who is gravely ill, or thoroughly miserable, or both. Old age in itself produces much in the way of suffering and discomfort. It is extremely important that we are not encouraged to help such people to kill themselves. Care, love, and a recognition of the inherent value of human beings have hall marked our official and personal attitudes to illness and suffering and Britain will become a very frightening place if this ceases. Of course all sorts of apparently humanitarian arguments will be presented in favour of the planned change in the law, but I do very much hope that as a responsible Member of Parliament you will take the longer view and vote against this. The young volunteers who make NIGHTFEVER happen come from a variety of groups. Some are from Soulfood, some from Youth 2000.Some had been to the New Dawn festival at Walsingham (see my earlier blog posts) and some came from a big prayer group in Birmingham. Some had been at Evangelium in July, and others on the recent John Paul Walk to Walsingham. I learned from my young team-mate that NIGHTFEVER began in Germany, an initiative following the 2005 World Youth Day with Papa Benedict...so this summer sees its 10th anniversary, and it's evidence of further fruit of Papa B's pontificate. At the end of the evening, we gathered for Evening Prayer - extraordinarily beautiful and moving in the candlelit church - and Benediction, and then a brief time of reporting back: which was when we learned that the grand total of candles lit was over 500 (517 to be precise), not counting those lit at side-altars and by the pieta etc. Being part of NIGHTFEVER is an enormous privilege and an unforgettable one. ...of Brigettine nuns who hid a Jewish family in their convent in Rome in WWII. A talk, based on the book Courage and Conviction, at Friday September 4th, 7pm, at the Brigettine Convent Guest House , Iver Heath. All welcome - no need to book, just come! ...in Norfolk, walking the pilgrim way to Walsingham. After a wonderful time at the New Dawn gathering, I came briefly home to London, tackled housework and various crucial bits of writing, re-packed, and set off for Bury St Edmunds, to join the John Paul Walk, back to Walsingham! A night's rest with crisp clean sheets, and a cooked breakfast, and then the bus to Kings Lynn. Norfolk buses have their own odd systems. No apparent bus-stop in Walsingham, you just wait at the village pump...and although a timetable at the Pilgrim Bureau gives information about bus times to Wells or Fakenham, the bus actually goes all the way to Kings Lynn, with the main stop being Hunstanton. Holidaymakers on the bus but also locals greeting the driver: "Morning Joe" "Morning Pauline" "See tall Andy this week?" "No, he's off work till next Monday" and so on. A long but delightful ride through the glorious countryside...one notices the changes of the years....old Methodist chapels now turned into shops or homes, villages and small towns with trendy craft-shops and coffee-shops, some closed pubs (a tragedy! ), signs in Polish or Lithuanian advertising delicacies from home. ...is the name of a vast annual gathering at Walsingham. This year I was invited to take part, doing a workshop on "Celebrating the Church's Feasts and Seasons" and also giving a talk to the whole gathering. Highlights of these golden days in Walsinghanm were a candlelit vigil of prayer before the Blessed Sacrament in the gardens around the big barn church, and a glorious morning procession (most pilgrims walking barefoot, as is traditional) down to the old Priory for a vast open-air Mass. These were memorable days, in which I found myself remembering dear Pope Benedict's words "The Church is alive, and the Church is young!" There were something like 2,000 people at New Dawn, families camping in the great fields around the shrine, young people gathering for their own activities, everyone joining together for Masses, talks, times of prayer. New Dawn continues for a week, but I left on Wednesday, for the rather delightful reason that I was about to take part in another great Walsingham event...the annual John Paul Walk, which starts at Bury St Edmunds! So I took the train home from Kings Lynn, spent one night at home, then packed and organised myself for this great annual Walk, which would return me to Walsingham! Vast crowds at Paddington, pouring off the trains and into the Tube etc, so I decided to walk instead. Hyde Park used to be famous for Speakers' Corner, where anyone could stand and excercise the right of free speech....long ago I used to be a regular speaker there, That was back in the 1970s. It's all so different now. It felt strange as an English woman walking across, wearing a casual summer outfit, the evening breeze in my hair...I was an oddity. All around and across the stretches of the lawns were groups and groups of Islamic ladies all havily veiled and in black, drinking tea and chatting, the younger ones all on mobile phones...most were fully masked although a few had their faces showing and wore full islamic dress but with coloured veils or scarves. Children ran about and further over were groups of Islamic men chatting. London, 2015. The Evangelium conference was a triumph: among the highlights a splendid lecture by Dr Roger Scruton, and a lively panel discussing apologetics, with Fathers Marcus Holden and Andrew Pinsent, and Sister Hyacinthe DeFos du Rau of the Dominican Sisters. Being part of all this was a great privilege, and especially to be invited to give the final lecture on St John Paul and the Theology of the Body. This was an attentive and receptive audience, a real joy to engage with them all.